Fighting for the Confederacy, Major Dalton learns that enemy soldiers have hurt his beloved wife and caused the death of their unborn son. Will he obtain revenge, or learn that vengeance truly belongs to the Lord? 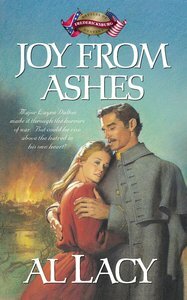 About "Joy From Ashes (#05 in Battles Of Destiny Series)"
Al Lacy has written more than one hundred historical and western novels, including those in the Angel of Mercy, Battles of Destiny, and Journeys of the Stranger series. He and his wife, JoAnna, are coauthors of the Mail Order Bride, Hannah of Fort Bridger, Shadow of Liberty, Orphan Trains, Frontier Doctor, and Dreams of Gold series. The Lacys make their home in the Colorado Rockies. American civil war fiction from an accomplished author of more than fifty historical novels. Thrilling, romantic, enthralling and inspirational. The Battles of Destiny series is now available in four attractive two-in-one volumes! Bestselling author Al Lacy packs each dramatic novel in the popular historical fiction series with heartwarming romance and solid moral values. Set during the Civil War, these are the tales of families, soldiers, nurses, and spies as they contend with the deadly threats posed by war and the eternal hope that springs from love. Fast-moving and historically accurate, these stories appeal to men and women who enjoy a trip back in time. Now longtime and new Lacy fans can purchase the entire Battles of Destiny classics and enjoy hours of endless reading pleasure. As the first winds of Civil War sweep across the Virginia countryside, the wealthy Ruffin family is torn by forces that threaten their way of life and, ultimately, their promises to one another. Mandrake and Orchid, slaves on the Ruffin plantation, must also fight for the desire of their hearts. Heartache and victory. Jealousy and racial hatred. From a prosperous Virginia plantation to a grim jail cell outside of Lynchburg, follow the dramatic story of love indestructible. Wounded early in the Civil War, Captain Ryan McGraw is nursed back to health by army nurse Dixie Quade. In her tender care, love's seed is sown. But with the sudden appearance of Victoria, the wife who once abandoned Ryan, and the five-year-old son he never knew he had, come threats endangering the lives of everyone involved. Between the deadly forces of war and two loves, McGraw is caught with a heart divided.